Predicting current or future ability of daily living has strong impact for health care, such as advising people to improve their way of life. 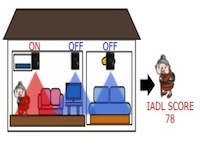 This research deals with a system for estimating elderly people’s current IADL scores from pyro-electric sensors embedded in their home. IADL is widely used as a criterion of people health levels in medical fields, so automatic evaluation of IADL scores from sensor data is important. In this work, we propose to use high-level activity features extracted from sensor data for robust IADL score estimation (e.g. sensor reaction in kitchen at noon is highly related to “cooking” activity). The experimental result shows the proposed method improves IADL estimation accuracy.